ICanToo - 100% Cotton Double Gauze Rolled Sleeve Collar Neck Tunic - 7470-DG. With a yoke in the back, this 100% Double Gauze (so its breathable and light, but not flimsy). Please note: the white is slightly transparent. This cotton top will be your favorite top to wear. The sleeves rolled down give a bit of protection, and when the sleeves are rolled up, you let the full breeze carry your cares away. The longer cut in the back will flatter your figure and the breezy gauze texture brings soft yet stylish comfort. Generous Women's sizes in S, M, L, XL, and 2XL. Be sure to see details in Size Chart. Made in USA. 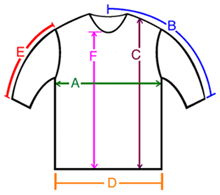 A: Chest / Bust circumference 44" 46" 48" 52" 56"
B: Sleeve length from center of neck to end of sleeve 28" 30" 31" 32" 34"
C: Body length from shoulder to bottom of hem point 30" 30" 32" 32" 33"
D: Hem circumference 52" 54" 56" 59" 63"
E: Sleeve length from shoulder to end of sleeve 22" 22" 23" 23" 24"
F: From the bottom of the Neck to hem point 21" 21" 22" 23" 24"